Welcome to Derbyshire Fossil Limestone. This beautiful stone is from the Once-a-week Quarry situated between the villages of Monyash and Sheldon, within the Peak District National Park. The Quarry got it’s name in the early part of the last century, as it was the only quarry that paid it’s workers weekly, when others paid staff fortnightly. Having recently secured a new long term lease from the Chatsworth Estate and planning permission for a new working area the stone is available again in good quantities. To protect the environmental issues and to minimise damage to the stone is is won by hand using traditional ‘plugs’ and ‘feathers’. A polished section of Derbyshire Limestone represents a portrait of ancient geological history, the fossils being amongst the earliest life forms on our wonderful planet. Your friends and family will be truly fascinated as they admire the beautiful fossils and imagine life on earth during the carboniferous period some 355 million years ago. Packed with fossils from over 355 million years ago, this distinctive material can be supplied as sawn, textured, honed, or polished finish slabs. Beautiful limestone is extremely durable and is suitable for almost any building application, external or internal. 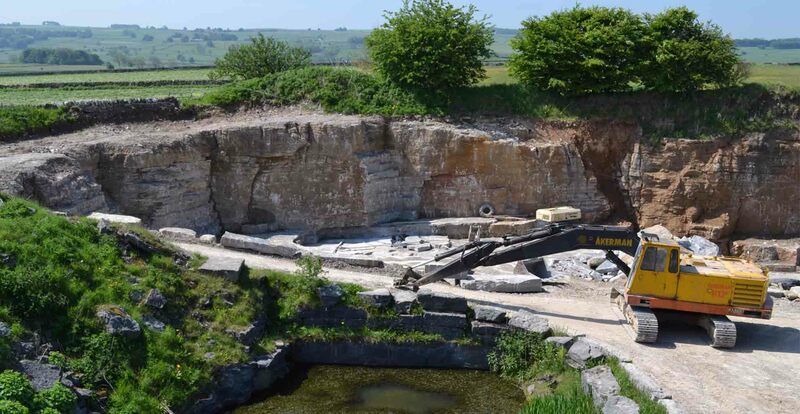 Traditional quarrying methods are used to carefully extract the stone and look after the environment. “Please find enclosed photos of our new kitchen, it is stunning!! Visitors love the unusual shape of the worktops and study the fossils for ages – there’re amazed how old it is! We want to thank you and your team for being so efficient and friendly and for providing such a beautiful end result. “Whilst renovating a cottage in Ashford in the Water and wanting local materials, we chanced upon Natural Stone Sales in Rowsley and were shown Mandale fossil limestone, which we decided we wanted for our kitchen worktops. The service from Richard and his staff were excellent from start to finish and nothing was too much trouble for them. The finished kitchen looks fantastic and the worktops are so beautiful and unique – each time you look you see something different.